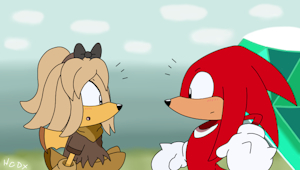 Mania Adventures Redraw - Another echidna? I've been thinking about this for a while now, and judging by your rather kind nature :3 , a bit of naiveness (still careful) ^_^ , tolerance and acceptance (how can you talk to someone like me?! Kidding!) xD , general coolness (and I think you have good tastes :3c), you're most like: Tails (who is awesome! :P) ~ out of all characters I know from Sonic animated series. Dunno if you'd agree or disagree, or maybe identify with another character (I didn't count their gender. x3)? So, are you doing better by now? Sorry my commissions are full right now, you don’t need to be on my patreon to commission me though just send a private message on here next time!